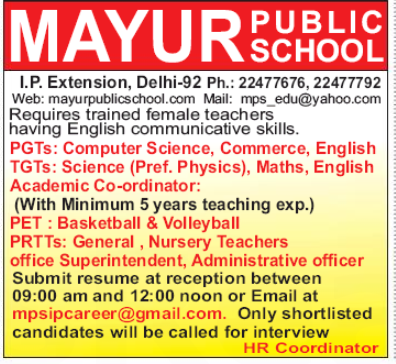 Mayur Public School, Delhi has advertised in THE HINDUSTAN TIMES newspaper for the recruitment of PGT plus TGT plus PRT jobs vacancies. Interested and eligible job aspirants are requested to apply by earliest. Check out further more details below. About School: Founded in 1989, with the motto of “Service before self”, it is an unaided, recognised, co-educational, senior secondary public school. The school, located in the heart of I.P.Extension, has a well-developed, progressive resource base and an excellent infrastructure and a learned faculty that promotes interactive learning.